Critical Mass may be called so because the bounty of buds is so heavy it could break a branch. This Indica dominant strain is a creation of Mr. Nice Seed Bank. It was bred to produce a high yield of flowers. Because of the density of the buds, Critical Mass marijuana has to be kept safe from molds. 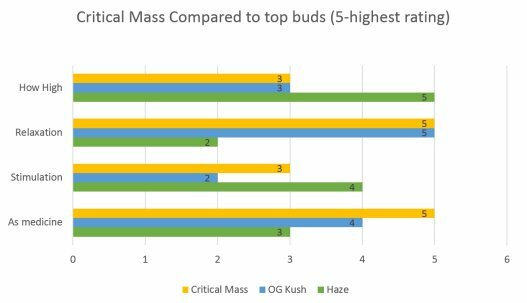 Critical Mass is a promising medical strain as it can have as much as 5 percent CBD. 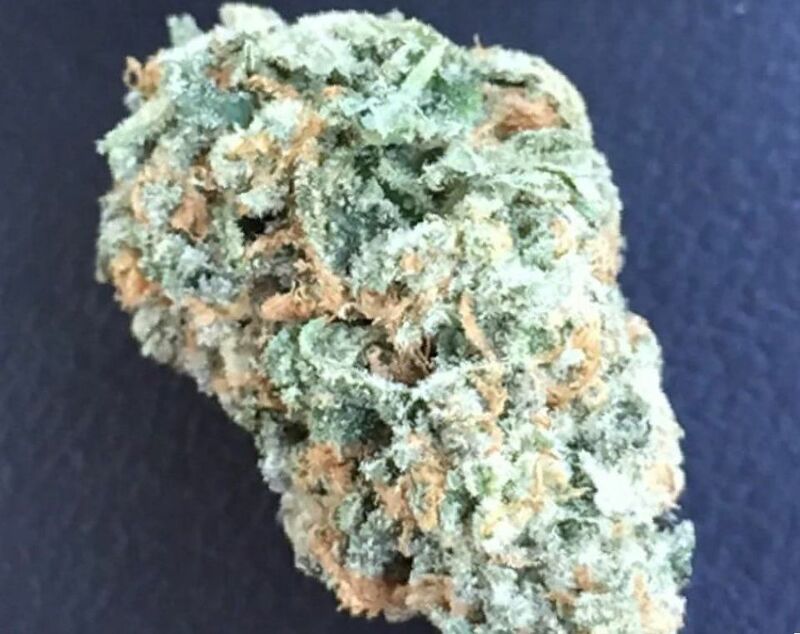 May Relieve Critical Mass buds are becoming a popular medical strain. 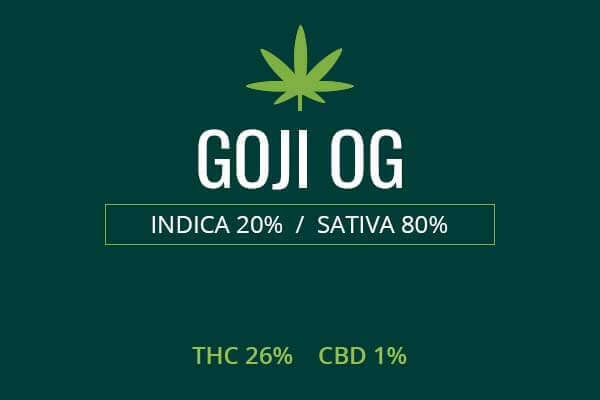 With its high CBD levels, it may be able to address some types of seizures. The CBD content will also help to ease inflammatory conditions like arthritis and Carpal Tunnel Syndrome. As well, migraines, other types of headaches, muscle spasms, sprains, and pains can be treated with Critical Mass medical marijuana. Musculoskeletal pain of many types such as neck and back pain may improve with Critical Mass medicinal cannabis treatment. Neuropathic pains such as from Multiple Sclerosis and diabetic peripheral neuropathy may also respond positively to treatment with the Critical Mass Strain of medical marijuana. Lastly, mood disorders and attention disorders such as ADHD may improve with treatment with this valuable bud. Indoor/Outdoor Yield Critical Mass is named in part for its bountiful yield. 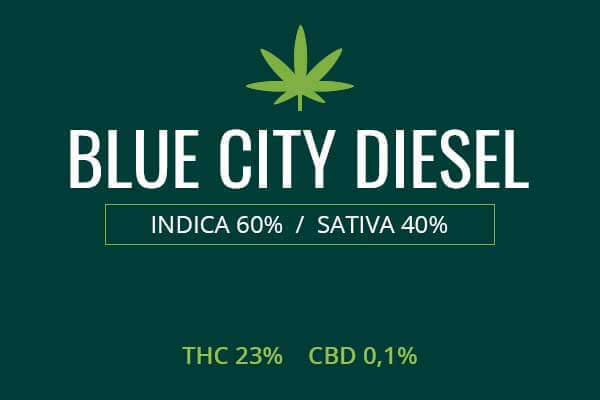 Indoors, a yield of 27 ounces per meter squared of high CBD, good, medicinal bud can be expected. Grown outdoors, cultivators can gain 21 ounces per plant of powerful cannabis around the middle of the month of September. Flowering time Critical Mass plants will flower in eight to nine weeks and be ready to yield its bounty of THC, CBD, and other cannabinoids and terpenes for the medical and recreational user alike. +Harvest Critical Mass will flower and be ready for harvesting and drying in the middle of the month of September. Plant Height Critical Mass marijuana plants grow to a medium height, between 32 and 80 inches tall. Adverse effects Critical Mass marijuana has little potential for side effects at doctor recommended doses. 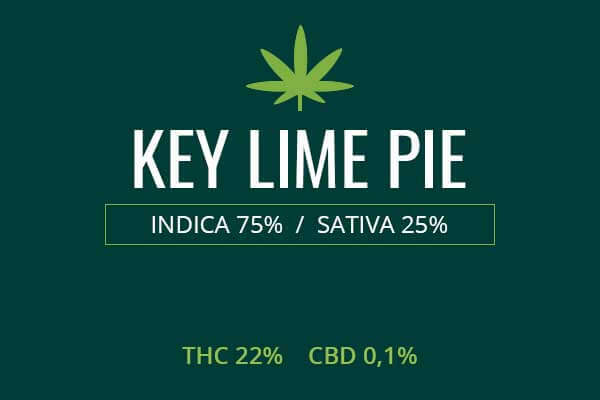 Because of the high CBD level, and its Indica genetics, it can cause some sleepiness and dry mouth. Critical Mass is so named because it produces numerous buds, adding a large mass of flower bursting with CBD and THC. 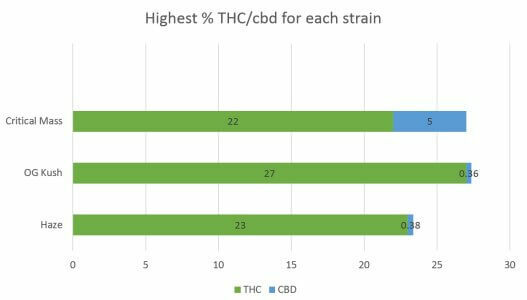 CBD levels can reach 5% and THC levels 22%. Critical Mass marijuana was bred by Mr. Nice Seed Bank. It’s bounty of buds is so overwhelming, it can weigh down and break the branches so care must be taken to stabilize the plant to harvest your full take. 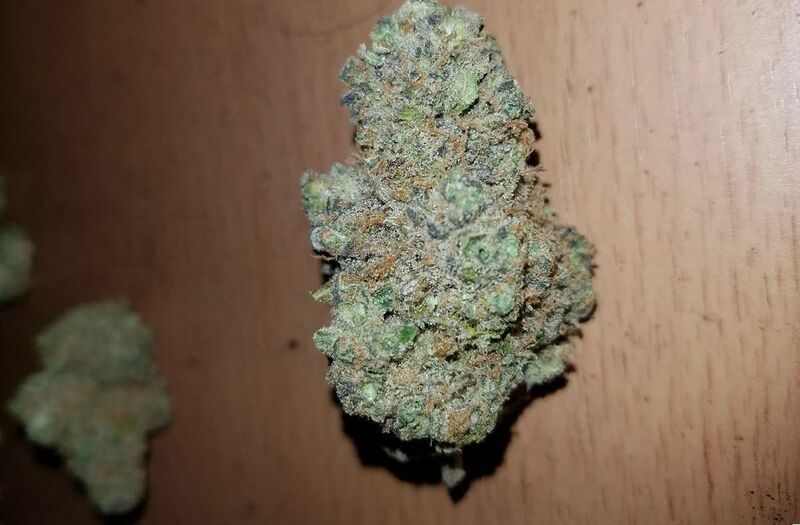 From its Afghani parent, Critical Mass gets a high yield and high resin production. From Skunk #1 it gets a euphoric energy. The Critical Mass plants are of a medium height. 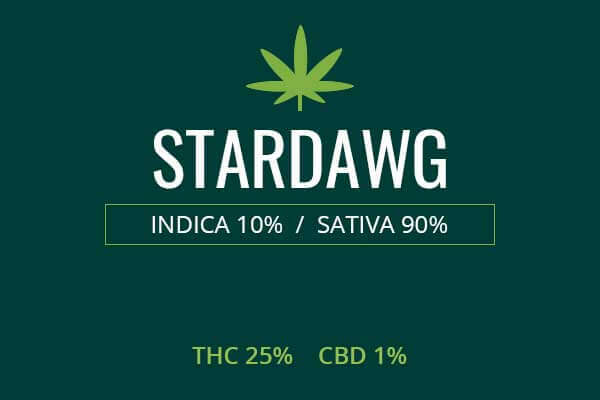 It is dense and heavy with green buds full of frosty resins with orange pistils and stigmas through and through. Critical mass has a sweet, citrus flavor. There is also an earthiness, a hint of pine, and wood. Growing weed from Critical Mass cannabis seeds and cuttings is rated as comparatively easy. A sunny, hot, dry environment is needed. Indoors, this environment can be simulated in a tent with lights, airflow control with a fan and exhaust, as well as humidity control. Critical Mass cannabis can be susceptible to mold when humidity levels rise. 5 Gallon buckets with overflow holes in the bottom may be used to hold your soil and fertilizer (Flower Power) in which you will plant your weed. You may choose to use High Density Discharge Lighting for your plants light source. Indoors, you will induce flowering with a light/dark schedule recommended by your vendor, such as 12 hours of light, 12 hours of dark. Flowering time should be in eight to nine weeks. Cultivators can expect a whopping 27 ounces per meter squared of high CBD medicinal weed. Growing outdoors can be an easier task for the cultivator. Just find a hot, sunny, dry climate and choose a watering schedule. Around mid-September your plants will yield about 21 ounces per plant of valuable, CBD-rich weed. Critical Mass medical cannabis has THC levels as high as 22 percent. This gives it considerable pain relieving properties. This can be a powerful weapon against musculoskeletal pain such as back pain and shoulder pain. It can attenuate inflammatory pain such as arthritis and joint problems. Critical Mass medical cannabis can also address neuropathic pain such as in fibromyalgia, shingles, Multiple Sclerosis pain, and peripheral neuropathy. Critical Mass medical cannabis has CBD levels up to 5 percent. This may be enough CBD to address some types of seizures, used as recommended by a doctor. Critical Mass can also have a relaxing effect which can be useful in mood disorders such as anxiety and depression. This weed may also help improve dysphoria and psychomotor agitation in ADHD and help to improve concentration. Critical Mass weed can be used to treat nausea that arises as a side effect of cancer and cancer treatment. It can also treat nausea from other causes such as dysautonomia. Critical Mass can give you an appetite. Some persons have difficulty eating and maintaining a healthy weight due to health problems. Critical Mass weed can give the patient the appetite needed to eat an amount which will help her maintain a healthy body mass. 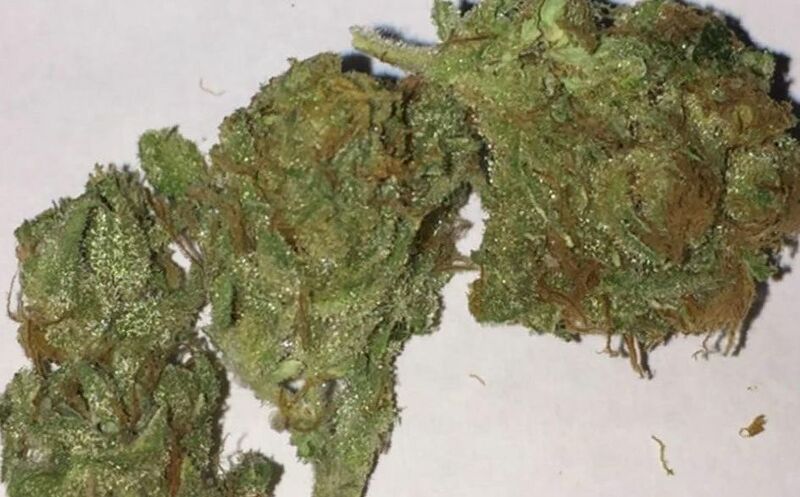 Critical Mass is an Indica with high CBD levels. This makes it a good choice for insomnia. Critical Mass weed can be extremely sedating, so when you toke, be ready to stay put. You may experience some couchlock as you are carried off into a state of warmth and giddiness. Critical Mass can be good to enjoy with people you trust closely. You may end the day passed out so it’s important to be among friends.